It’s been a long time since an online game as addictive & immersive as Glitch reared its angelic head. But now, finally, another one of those games has been shared with the public world, one just as beautiful, diverse, and fluid as Glitch, one that definitely builds upon its predecessor. The “threequel” of a wildly successful and silly online game saga, this game has taken its fancy-pant-wearing hero to newly epic proportions never seen before in his history. What’s all the hub-bub about? In this gripping episode, you’re going to find out. Even when the backgrounds don't move an inch, Fancy Pants Man has clearly defied the rules of beauteous surroundings. If you remember one of my old posts back in 2010’s days, you’d remember the time when I excitedly blabbed about the announcement of the upcoming World 3 (or at least, all we have of it, the real release date is TBA) in the Fancy Pants Adventures trilogy, the obvious follower of World 2. I rambled on about its debuts of distinguishable toppings to the sundae, including swimming and water-related levels, the introduction of Fancy Pants Man’s sister and her cat, pencil combat, and lots more. Now, you can’t believe the excitement I had when right here, right now, the sneak peek, the closest we can get to World 3, has come, and it’s not just the most beautiful game in the trilogy. It’s one of the most breathtaking online games I’ve ever played, hands down, deal is done. If you think Super Mario Galaxy 2 was the best adventurer’s game you’ve played, wait till you see this. FP Man can do lots of stuff with the water, including a brief session of surfing. Fancy Pants Man clearly proves that stunning visuals, marvelous gameplay, catchy tunes, and proficient, solid distinguishes really do add up for one of the best experiences you’ve seen. Enemies have a bit more smarts in the game now: the gun-wielding rat (or, as I like to call him, the “gunmouse” *ba dum CRASH*) can now aim his gun in different directions, a new miner headlight-bearing spider is smart enough to safely land on surfaces below him, blabbity blabbity bloo. I’ve been waiting a long time to tell you about my favorite part of this game: the swimming levels. Whether it’s for a task or just a visit to the wonderland of wetness, the swimming levels are by far the most beautiful aspects of the game, mixed with its equally beauteous music. I kept repeating quotes like “It’s so beautiful”, “I feel like I’m gonna cry”, or “(too sucked in to say much)” while I was swimming through the waters. You could also do lots of stuff like “surf” on the surface of the water, push off of undersea surfaces and fly gracefully into the water, and more. If this is how Michael Phelps practiced for the Olympics, it’s no surprise he’s a multi-gold-medalist. Definitely a game I’m proud to have on my Chrome homepage, and definitely one I’ll come back to and enjoy all over again. 1 out of 5 – Educational value – Your brain does get tested a bit in timed challenges, and maybe getting from place to place requires a bit of logic, but the game is mainly an entertainer, not an educator. 2 out of 5 – Positive role models – Fancy Pants Man is a veteran hero as well as a parkour master and a journeyer. He’s definitely brave enough to fight for things worth fighting for. 5 out of 5 – Ease of play – The controls are easy to grasp: left and right to move, down to duck, and S to jump. Jump onto a wall to begin wall-climbing, and with just enough momentum, speed, and time you might end up wall-jumping from building to building (Jump & direction to do so). These controls work well and are etched into the game appropriately. 3 1/2 out of 5 – Violence – There are rats that wield pistols that will attempt to shoot at Fancy Pants Man (but the fired “bullets” look more like balls of scribble), as well as spiders that will attempt to cause harm to our hero. FP Man can retaliate by jumping onto them, making them now able to kick, which is what he can also do to snails. When FP Man loses his health, he will fall to the ground, and his angelic soul will rise. 0 out of 5 – Inappropriate Content – There is one girl in the game, FP Man’s sister (excepting her cat, if she’s female), but there’s no steamy affection in the game. 0 out of 5 – Language – The only thing Fancy Pants Man will say is “Ow!” (after being hit by an enemy), so there’s no colorful language to go around. 2 out of 5 – Product Placement – World 3 is the third of a very successful and popular online game trilogy called Fancy Pants Adventures made by Brad Borne (who also went on to make Mirror’s Edge 2D), and you can find the games pretty much anywhere from Armor Games to Newgrounds. 0 out of 5 – Drinking, Drugs, and/or Smoking – This aspect is not featured in-game. Cutie Pants Girl (FP Man's sister) swings into action using Kitten Kabootle, her cat. Whatever I just mentioned above. Little to strive for means that you’re just running around for nothing. CONSENSUS: A beautiful, fluid, and atmospheric entry into the series, the World 3 sneak peek is not just the most immersive, beautiful, and solid entry into the series; it’s simply one of the most breathtaking online games created. Click here if you want to play the best online game you’ve ever played, EVER. Play it and weep. Now, as the title says, we’re not finished quite yet. Fancy Pants Man may have embarked on a beauteous journey, but that doesn’t mean his minutes in heaven are over. Fancy Pants Man is going predictably where no online game hero has gone before; the PlayStation Network and the Xbox Live Arcade. It may not be World 3 (perhaps the origin of a devolution), but the console game will include a 2-4 player mode, pencil combat just as World 3 promised, and a fresh batch of new levels, as well as the ones from World 1 and 2. Similar to Limbo, the console version’s story will be about FP Man’s journey through pirates and pencils in order to save his pirate-kidnapped sister. There might also be, according to footage, a “king of the hill” mode in the game, and if you still don’t believe me, check out this trailer. Subscribe, rate, like, com—oh, come on, do I really have to tell you what to do every time? This blog’s been alive for almost 2 years! p.s. Giants or Patriots? The Super Bowl’s only two days away! Hey it’s Sam, and when gaming and voting collide, we have another fresh-off-the-grill Game n Vote to kick off the beginning of August! 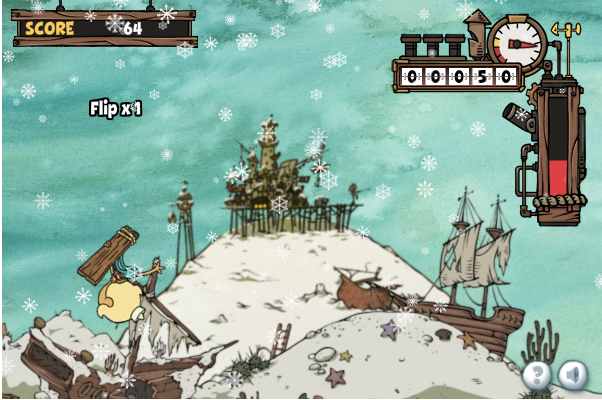 😀 Another one from Flapjack (click here if you missed the first), this game takes the water and freezes it into a winter wonderland in today’s harbor adventure, Thrills and Chills. The title screen has to be the most enticing aspect of the game itself. If you thought Adventure Bound was a ridiculous concept, you ain’t seen nothing yet! It has to be the easiest, most tedious, and most nettlesome* game I’ve ever played. (*nettlesome = annoying) Do you know how hard it was to compensate to that pestiferous theme song while making this post alone? Flapjack has found a new winter adventure: Flipping and flying all over Stormalong Harbor!…Yes, that’s it. 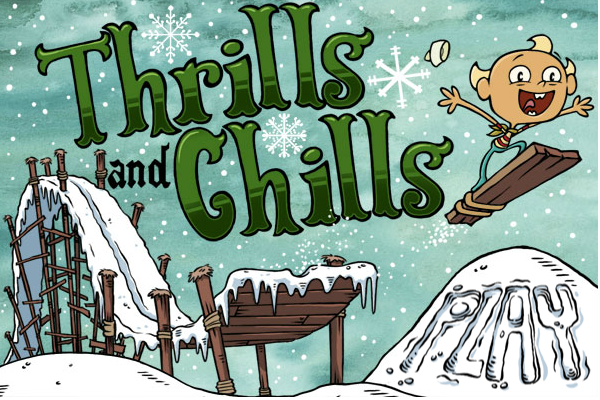 You have to make Flapjack do flips on a piece of wood as the snowy, woody ground slopes down, curves up, and makes gaps to trick over…or fall into, which is A) hilarious, and B) what that little kid deserves. If this is the future of Tony Hawk games, then I’ll never buy another Activision product again. The game has an interface with ‘PLAY’ carved into the snow (what. ), and some wintery music playing in the background. But all the game breaks down to is: Jump, make a trick. Jump, make another trick. Jump, bail face-first. Rinse and repeat. There’s no collection of levels to progress onto; it’s just one undersized level that you have the power to begin, but you don’t know when it ends. There’s not even any other characters, or better boards. It’s just Flapjack and a lousy piece of wood. Would you want to play that for a half hour? 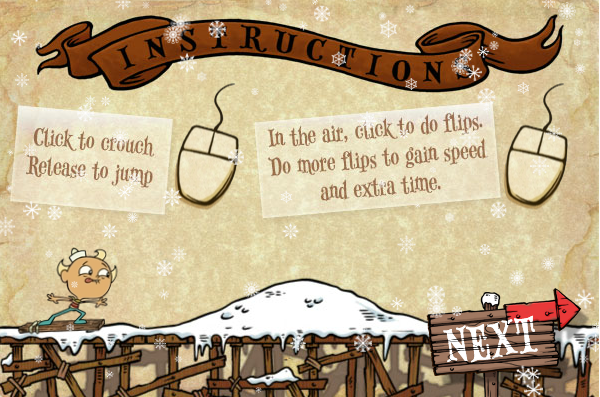 This is another Flapjack game where the mouse is a main component. With your cursor in play, you click to crouch, and release to jump. Airborne, you click to do flips for speed and extra time. There’s pretty much nothing beyond that. So, it’s kind of a letdown. I guess I’ll have to say it now: SON, I AM DISAPPOINT. It’s easier than peeling a banana, but as tedious as the latest Harry Potter game. Maybe even more. The easiest controls in the world, in a nutshell. 🙂 At least the controls are easy to learn. 🙂 When you pick up speed, it gets more “thrilling” than usual. 🙂 At least the Flapjack model looks good. 😦 The game has the most annoying theme song ever. (Adventure Bound, you’ve been dethroned.) And when it ends, it loops right back into the beginning. 😦 You’re more likely to bail than to boost, and did I mention the time spent bailing clocks in at 3 SECONDS?!?! 😦 You don’t know when the level will end. You could be preparing for an epic trick, but then Flapjack bails off board himself and begins dancing, which marks the end of the thrills and chills. 😦 Did I mention that you can’t play again? No, literally. You try to hit ‘PLAY AGAIN’, and the game is unresponsive. Ignorant. 😦 You’re doomed for a face full of snow when you wind back on the tip of your board? 😡 It’s like doing a manual, and those always work!!! 😦 No voice acting. None at all. No “whees”, no hysterical laughter, no “oofs” in mid-bail? That’s another slab of perfectly good character stripped away. 😦 The worst sound effects ever in a game. When you bail, it sounds like a car horn mixed with a swung golf club. You call this rewarding? I call it punishment. Awesome? I know, I know. If you enjoy this post, and you are a WordPress blogger, than please like me, and to any of you out there who don’t even know what WordPress is, please subscribe to me. And thus concludes another Game n Vote! Check back for more in the weeks to come, and remember: What you think isn’t really is even though it seems it isn’t but it really is what it is. Isn’t it? Hey guys it’s Sam, and it’s been long since we’ve had a personal time to game and vote. Well, here we are, and this game is yet again, from Cartoon Network. But this one’s not from Adventure Time; it’s from Flapjack. I know that show hasn’t been around since the late summer of 2010, where it was cancelled but ended. 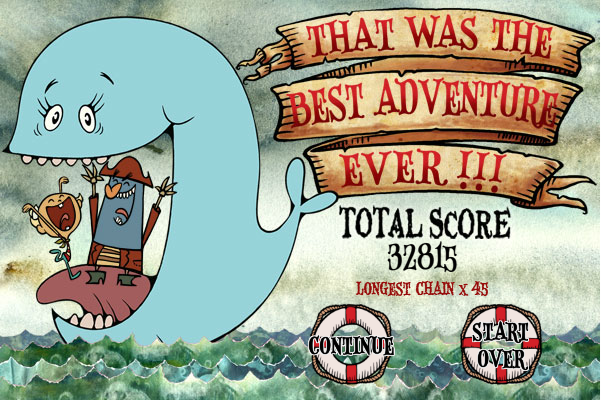 This game is an adventure at sea, and it’s real adventure bound…that’s why it’s called Adventure Bound. Flapjack scores some precious loot in-game. It’s a good thing that the games of forgotten Cartoon Network shows are still around, because I’d never find this game without them. And for a sailor’s venturing, it’s actually pretty fun. The concept may be freaking ridiculous, but at least there are some solid sound effects to captivate those moments. 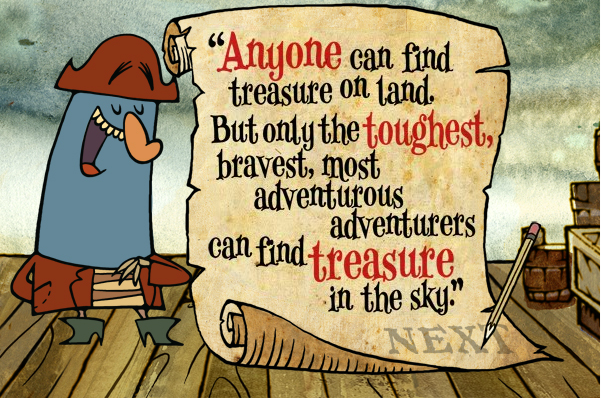 It’s actually just that Flapjack and K’nuckles want to find treasure in the sky, only what the bravest, most adventurous adventurers would do. No, seriously that’s what Captain K said himself. 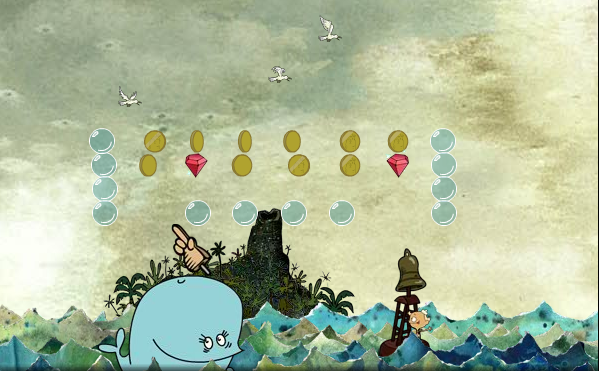 This is the concept which I said was “freaking ridiculous”: You control Bubbie the whale (with Flapjack and Captain inside), and click to send one adventurer in the sky through her spout, and it’s your job to catch them before they bounce into the sea. And don’t forget them precious chains/combos. Pretty ludicrous, huh? Adventure Bound has a sleek user interface with that sailor feel, such as seaside sounds of anchors and birds, but the noise is too much when you just want to hit play. However, the venturing gets old, and there’s little variation from one level to the next. And it actually takes more time than expected to recover a player overboard. The gameplay is so easy, a caveman could…play it. (Geico sue deflect!) 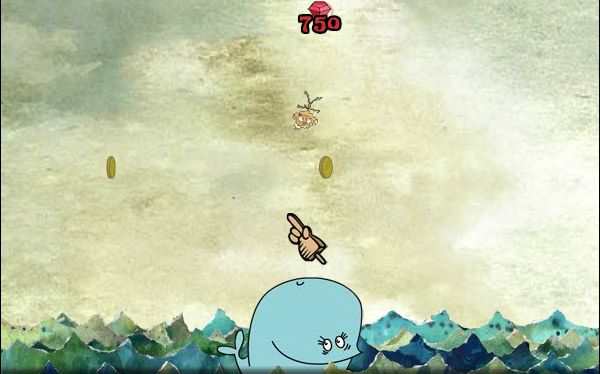 It just consists of moving your mouse to control Bubbie, and click to send a player into the air. A little too easy, but I have to say, the gameplay does come out clean. It has good interest rate attractions, the situations remind you of the show, and it’s actually easier than you think. 🙂 The interface is well-crafted. 🙂 The gameplay is easy to learn for beginners. 🙂 Good environments to fess up for corked visuals. 🙂 Controls have great, if not perfect, outcomes. 🙂 Yes, there are badges, which equal goals to strive for. 😦 There’s no pausing, let alone getting out. 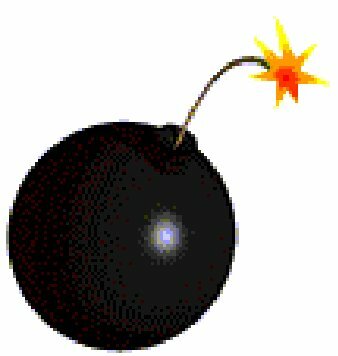 Is it Super Smash Flash 2 again? 😦 The main levels are awfully easy, even at level 5 or higher. And the amount of coins there is in environments like bubbles and seagulls might be near to impossible to catch without losing a matey. 😦 No one talks. No one at all (excluding the horrific voice acting). No hysterical laughter, no “Whees”, not even any startled cries falling overboard? 😦 You send out adventurers at random. You don’t know what to expect. It’s not like Tetris, where you can know what block is next, and hold it or anything. 😦 At the bottom right, you’ll see your progress bar. (That’s what I call it.) It has Bubbie on it (you), and it swims as you swim to track your progress. However, it can swim off the bar and off screen…. 😦 Speaking of the bonus game, it starts out easy, but it gets punishingly hard. You have to click faster than a running gazelle. That’s why the “Get x8 in the Bonus Game” is impossible to get. 😦 The voice acting is abominable. Flapjack and K’nuckles alike both sound like screaming men. 😦 Not a completely reasonable storyline. 😦 The most annoying game music I’ve ever heard, even if it does fit the situation. Even if you fall overboard five times, it's still the best adventure ever. The whole bonus game, in one picture. Adventure Bound isn’t the best Flapjack game out there, as it gets quite old, and quite tedious, quite fast, but for beginning Flapjack gamers, with its enticing controls and down-to-earth environments, what more could you ask for? 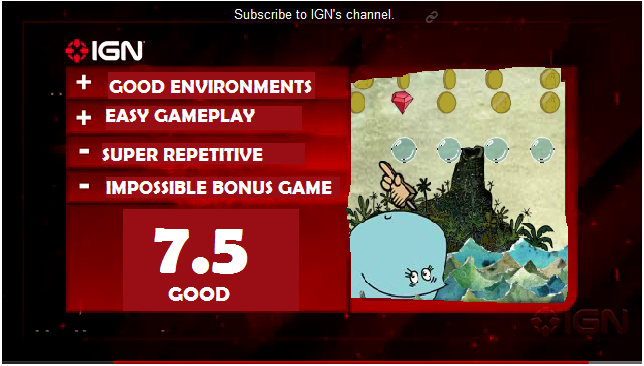 My final score is a “good” 7.5 out of 10. 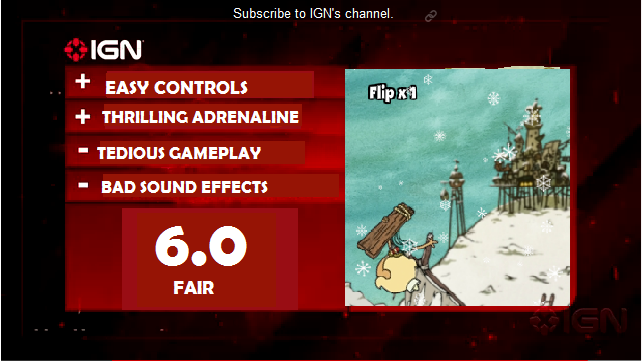 Or, as IGN would do it.. Pretty impressive, huh? Anyways, you can check out Adventure Bound yourself by following the rainbow…just kidding, just follow this link. Happy spouting! Back after a long day at sea? Time to vote! Check back for more rip-snooting good times with the ultimate gaming-and-voting fusion! This is Sammwak, and remember: Don’t do drugs, sleep with a turtle, dance with a grasshopper, and play with an ant. Hi to all. It’s me Sam, and whoops, again! It’s been seconds, that turn into minutes, that turn into hours, that turn into days, that turn into weeks, that turn into months, that turn into YEARS since I’ve given you a Game n Vote. I’m sorry, but I’m such a procrastinator these days. So, in my return of sincere apology, I’m BACK with a handful of more gaming and voting! Today’s game is from the brand-new Cartoon Network animated comedy, The Amazing World of Gumball. Heard of it? A cat named Gumball, and his fish-with-legs friend Darwin? Well, the Interwebs finally decided to make a game for it…from thence, Splash Master was born. I just heard about this game through an ad on Cartoon Network itself, during a commercial break. 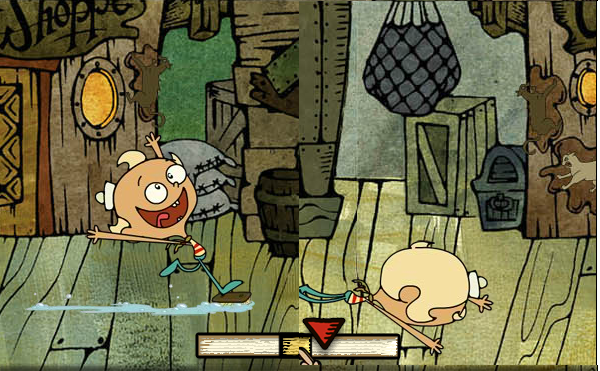 The real backstory of this game is super-catchy: Gumball and Darwin are looking for the most epic swimming dive. The two take turns diving off a board. In the air will be shining rings, and obstacles (mostly birds and flowerpots, for me). Your job is to collect enough rings to reach the target of required rings, while avoiding obstacles. If you run into one, you’ll lose some rings (which eventually will come floating down)! For extra flair, click your mouse to do stylish tricks, like when Darwin holds his arms to make a heart, and Gumball outstretches his arms while his legs are curled in; all of this done upside down. The board keeps getting bumped up, and so is the target amount of rings. You’ll be diving to shake paws, or fins, with the moon, but it gets a little wacky once you’re high-diving in SPACE! (Try shaking hands with E.T.) 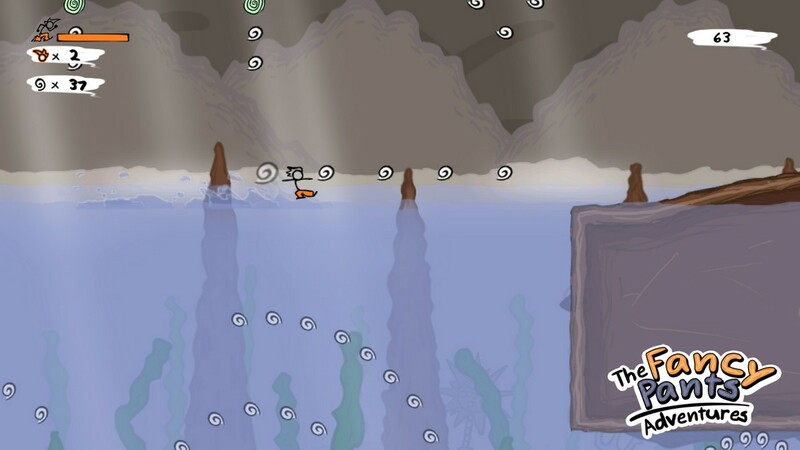 If you collect enough rings, your objective now is to click again to form a cannonball to land into the water, making a humongous namesake splash. Nicole, Richard, and Anais will be waiting, and they will give you a score on your dive, the maximum being 10. 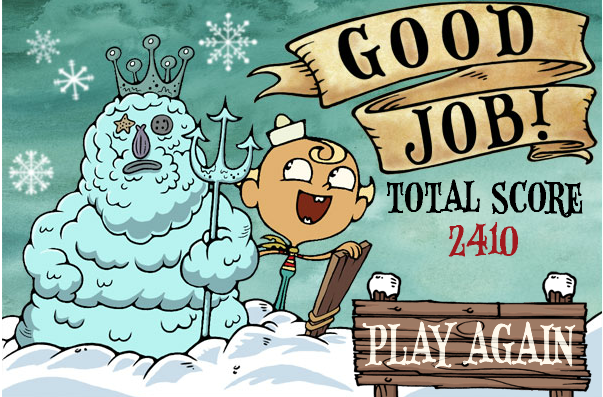 Splash Master has 46, 942 players…can you be one? I set a super high score of 242, 350 points, making me a “True Pro” diver. Can you beat that? All of this makes the game a very enticing pick, but let’s talk about its downside. If you dive what you believe is a perfect dive, the judges might still give you scores lower than 10. That means those judges are critical. And after becoming a True Pro diver, the drops get faster, giving you less time to collect all the rings. TOO MUCH OF A CHALLENGE HERE, GUYS! Give us a couple more Easy As! And the ability to only play as Gumball and Darwin ONLY gets very tiresome along the way. And besides, you know how funny it would’ve been to see Richard all out? And WHAT THE HECK IS A SWAN DIVE?!!!? I spent several MINUTES trying to unleash a swan dive, but the game still leaves me baffled! They should have more easy controls next time. Hopefully, if they give this game a sequel (like Adventure Time‘s Sound Castle and Righteous Quest), they’ll fill all these empty cups for us. Capiche? My final score for the game is a .5 out of 10. And if you remove that decimal, that makes a 75 out of 100. Now go out there. Get jiggy with it. Become the ultimate Splash Master (that is, if you can beat me)! So, you’re back after an epic diving adventure. Now I have a couple polls for you to fill in. A badge for performing every trick in a single dive. A badge for completing a dive without getting any rings. A badge for performing a swan dive. A badge for performing a dive from space. A badge for collecting 300 rings in a single dive. A badge for scoring three perfect 10s in a single dive. Well, this is goodbye from Sammwak for now! Check back for more…oh, I already told you that! A creation of “Man of Action”, this animated action stars an amnesiac hero voiced by Spy Kid Daryl Sabara (Juni, anyone?). The sci-fi action TV series still running off of the 2008 CGI movie of the same name, which critics are still saying was pretty suckish. A new action series on Cartoon Network adapted from the actual DC Comics superhero team of the same name. Sixteen teenager heroes are noted to be part of the group, counting the mentors. Another unforgettable creation of “Man of Action” (see Generator Rex) that is the 3rd incarnation of Ben 10 so far. You have heard of Ben, right? The kid that can turn into different alien forms? Yeah, that’s him. Fasten your seatbelts, action-hoarders! Because you have a whole night to hoard that’s full of what you love. Oh, me? I’ll probably skip the show (I’m not an action-hoarder; no offense) and do other more important stuff. Not that the show’s not important, it’s just…oh, you see my point. Burnt omelets, too much vinegar, undercooked chicken, oh my! In Worst Cooks in America, twelve of America’s actual worst cooks are taken, split into two teams (red and blue), and put to the test for Anne Burrell and Robert Irvine (of the 2nd season) to see who will evolve from rowdy kitchen zeroes to righteous kitchen heroes. And who will remain…the worst cooks in America. This show is a perfect combination of cooking, competition, and comedy. Is there anything funnier than watching someone light their stove on fire, or watching someone give themselves an overdose of oil? Worst Cooks in America has it all, and it has been since January 2010. You can grab some popcorn, slump on the couch, and laugh so hard soda ricochets out of your nose! What’s not to love? I guess this post is worthy for both kids AND adults, again. p.s. Happy cooking, cooks and chefs!